Glass Solutions has launched a range of jacketed reactor systems combining excellent value with reliable performance for process development, reaction optimization, or production applications. 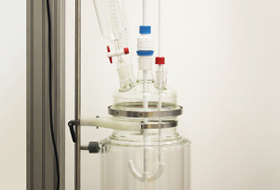 Ideal for crystallizations, process work-ups, distillations and bioreactions, Glass Solutions Reactor Systems are designed for process development labs, kilo labs and pilot plants, and can be used in a diverse array of scientific disciplines, from the pharma and fine chemical industries to the flavor and fragrance, petrochemistry, and agrochemistry sectors. Chemically-resistant and simple to use, these robust, high quality systems are available in a wide range of benchtop or floor standing formats, as well as customized set-ups to meet specific needs. Precision manufactured at the company’s cutting-edge UK facility, single or vacuum jacketed reactors can be supplied in a variety of sizes – from 500 ml to 70 l – accompanied by a broad choice of circulators, multi-port lids, stirrers, reflux condensers, dropping funnels and distillation systems to suit virtually any application.